The following article by CIDNA resident Michael Wilson was published in the January issue of the Hill and Lake Press. This entry was posted in Southwest LRT on January 31, 2015 by citoyen1789. Whitney delivers an impassioned plea to faithfully implement the Above the Falls Master Plan, protecting it from being eroded by private interests to the detriment of the common good. John explains how the St. Anthony Falls Locks failed to live up to hopes for economic viability, and the invasive carp threat were just the final trigger for closure. Tom recaps key moments in recent history of the Central Riverfront, culminating in the lock closure. Nan details the logistics of the lock closure, shares possibilities for the future, and gives an update on hydro projects at St. Anthony Falls. This entry was posted in Central Mississippi Riverfront on January 29, 2015 by citoyen1789. I am extremely disappointed that the Governor wants to punish the Park Board and more than 15 million users of regional parks in Minneapolis because the Met Council did not do their job in their pursuit of taking park land.Today Governor Dayton recommended reducing $3.77 million in funding for the regional parks that the MPRB operates and maintains for local and non-local visitors. 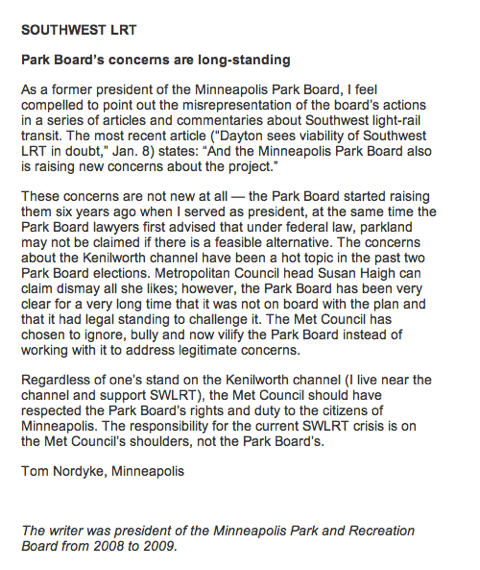 I am dismayed that he is recommending this reduction in funding to the Minneapolis Park and Recreation Board “due to the Board’s continuing efforts to obstruct progress on the SWLRT project,” when the Park Board has provided the Governor with ample information to the contrary. In addition, the Governor has been misinformed about the Park Board using state money to do the engineering studies; the Park Board has not and cannot use state money for these studies. This entry was posted in Southwest LRT on January 28, 2015 by citoyen1789. The complete agenda, with staff reports, for the MPRB Board of Commissioners meeting on January 21, 2015 is at http://minneapolisparksmn.iqm2.com/Citizens/Default.aspx . Board meeting agendas and related information are posted on this web page two business days prior to meetings. Webcasts of MPRB regular board meetings are posted on the same web page two to five business days following each meeting and are available for viewing, along with webcasts for the previous two months. This entry was posted in Board Meetings on January 18, 2015 by citoyen1789. The lock is scheduled to be closed in June 2015. Its closure will change river management practices and have an environmental and an economic impact far beyond the Falls and the local area. The Forum is designed to help us better understand both the immediate and longer-term consequences of the closure and to hear ideas about how the site and the river can be used in new and different ways. This entry was posted in Central Mississippi Riverfront on January 17, 2015 by citoyen1789. The following article by Peter Callaghan was published in the January 8, 2015 edition of MinnPost. The Park Board, led by Liz Wielinski, above, hired an engineering consultant to show that extending the shallow tunnel beneath the channel is feasible. Pressure is being applied from several directions on the Minneapolis Park and Recreation Board to halt its path toward a legal challenge to the approved route for the Southwest light rail transit project. Gov. Mark Dayton used a radio interview broadcast Wednesday — but recorded last month — to drop a bit of a bombshell, or perhaps a warning, about the future of the extension known as Southwest LRT. This entry was posted in Southwest LRT on January 14, 2015 by citoyen1789. The following article by Dylan Thomas was published online in the Southwest Journal on January 7, 2015. File photo: The channel between Lake of the Isles and Cedar Lake in winter. Since it won a $245,500 contract in November, engineering firm Brierly Associates has developed two potential options for tunneling beneath the waterway that connects Lake of the Isles and Cedar Lake. Jan. 7, on a 5–2 vote, the Park Board approved spending another $248,275 for a second phase of work that will further assess those two options, particularly their potential to impact the lakes, groundwater and nearby parkland. Parks officials maintain the Metropolitan Council, the lead agency on the nearly $1.7-billion light rail project, did not thoroughly examine tunneling options before settling on a new set of bridges that will carry light rail trains, freight rail trains and pedestrian and bicycle traffic over the channel. Parks Commissioner John Erwin said his vote in favor of the Brierly contract wasn’t an attempt to delay or derail the project. This entry was posted in Southwest LRT on January 13, 2015 by citoyen1789.